Elite 2 Form Release is non-staining, chemically active, highly refined mineral oil based form release coating. Formulated to provide the concrete construction forming industry with an environmentally compliant release agent for both indoor and outdoor application. Elite 2 Form Release is formulated without diesel fuel. Forms are ready for re-use almost instantly. Elite 2 Form Release produces a smooth, void free, architectural concrete surface. VOC compliant. Elite 2 Form Release will aid in the release of the form from hardened concrete on the widest range of forming material. Elite 2 Form Release will help eliminate the general “petroleum odor” from the commercial jobsite. Ideal for both interior and exterior concrete forming applications. Elite 2 Citrus Form Release is non-staining, chemically active, highly refined mineral oil based form release coating. Formulated to provide the concrete construction forming industry with an environmentally compliant release agent for both indoor and outdoor application. Elite 2 Citrus Form Release is formulated without diesel fuel. Forms are ready for re-use almost instantly. Elite 2 Citrus Form Release produces a smooth, void free, architectural concrete surface. VOC compliant. Complimented with a sweet citrus aroma. Elite 2 Citrus Form Release will aid in the release of the form from hardened concrete on the widest range of forming material. 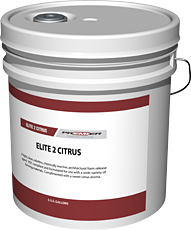 Elite 2 Citrus Form Release will help eliminate the general "petroleum odor" from the commercial jobsite. Ideal for both interior and exterior concrete forming applications. Zerlex is a general purpose concentrated compound consisting of a highly refined group of ingredients in a solution of non-staining petroleum hydrocarbon. 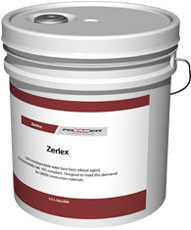 The active ingredients of Zerlex reacts with the excess lime present in fresh concrete to produce a positive release action on a variety of concrete forming materials preventing sticking and build-up. Zerlex is formulated to dilute with a V.O.C. compliant oil or other approved diluent. For use on formwork prior to casting concrete, to achieve a clean release. Zerlex may be used on forms made with: Steel, aluminum and commercial plywood forming materials. 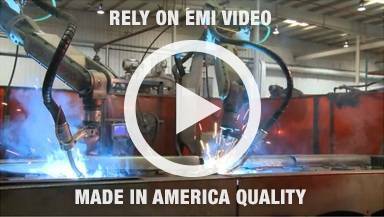 without taking forms out of production.